We are pleased to announce the speakers of a special session in cooperation with the UNESCO, that will take place on the second main conference day (Saturday, 18 July) from 11:00 until 13:00. José Antonio Brambila from University of Sheffield, England will open the UNESCO session with his speech about ‘Boundary Control Strategies to Local News Media in the Mexican Provinces’. Michelle Betz is a senior media development consultant researcher. Her areas of expertise include media in conflict and post-conflict, military-media relations and election reporting. Betz has more than ten years of international experience, mostly in sub-Saharan Africa and the Middle East. She has consulted for numerous organizations and UN agencies including UNESCO, OSCE, International Media Support, Institut Panos Europe and UNDP and has lived and worked in more than 20 countries and is currently based in Vienna, Austria. Dr. Paul Beighley is a Regional Medical Officer – Psychiatrist with the United States Department of State currently assigned to U.S. Embassy Vienna. He has been a Foreign Service Officer for the last ten years and previously served in West Africa, the Middle East, and Washington DC. Dr. Beighley attended medical school at the University of Texas in San Antonio and is a veteran of the U.S. Air Force. He has worked as an adjunct faculty member at both the University of Oklahoma and Florida Institute of Technology. The two of them will present the topic ‘But What about Me? Challenges in Support of Local Journalists During, and in the Aftermath of Psychologically Traumatizing Events’. Reeta Pöyhtäri, UNESCO’s Expert for Journalists’ Safety Indicators, will give a speech about ‘UNESCO’s Academic Research Agenda on Safety of Journalists’. Mona Badran from Future University, Egypt will finish the UNESCO session with her topic ‘Violence Against Journalists: Suppressing Media Freedom’. Her research is investigating the present situation of journalism and free expression in Egypt, where official and non-official threats and attacks targeting journalists are still intact. Such acts result as a true challenge to press. In addition, this research aims at explaining and discussing in depth the reasons behind such trends and their relation and impact on the future of political freedom in Egypt, the most populous Arab country. This entry was posted in News and tagged unesco. On our first main conference day we have some interesting guests with amongst others political and economic background for the keynote speaker session (Friday, 17 July). In the first round we welcome Alexander Dobrindt, Federal Minister of Transport and Digital Infrastructure in Germany, just as Georges Santer, Ambassador of the Grand Duchy of Luxembourg in Germany. In addition, Uwe Dumslaff, Corporate Vice President and Chief Technology Officer for Capgemini Germany participates in the keynote speaker session with the topic: D21-Digital Index 2014 – the Development of the Digital Society in Germany. Lastly in a second round, Gunther H. Oettinger, European Commission, Commissioner Digital Economy & Society, is honouring us with his visit at the conference. This entry was posted in News and tagged digital infrastructure, digital society, keynote, keynote speakers. We are glad to announce that daily newspaper Frankfurter Allgemeine Zeitung (FAZ), literally Frankfurt General Newspaper, supports the Global Communication Association for this year’s conference in providing the Frankfurter Allgemeine Forum for a round table discussion on our first main conference day (Friday, 17 July). The Frankfurter Allgemeine Zeitung is knows as one of the most significant national daily and business newspaper in Germany. The newspaper stands for diversity of opinions and independence, for comprehensive reporting and incisive commentary on topics in politics, economy, arts and culture, science, education and society. Gathering in the evening of Friday in their establishment in Berlin, we are hosting a round table discussion about the hotly-debated topic Digital Transformation in Media Companies. Sebastian Turner, Editor Tagesspiegel, Germany. This entry was posted in News and tagged digital transformation, FAZ, Frankfurter Allgemeine Zeitung, media companies. The topic ‘Education and Learning’ will be covered and introduced on Friday in the Parallel Session B2. Appropriately, Saturday’s session C4 continues with more interesting speeches revolving around the topic of effects on education and learning in the wake of globalization. Tahereh Ebrahimi Far is a Ph.D. in Political Science, and Associate Professor of Political Science at Islamic Azad University-Central Tehran Branch. Furthermore, she is a Member of the Board of Directors at the Iranian Political Science Association, and contributes to the Scientific Journal of Political Science.In her speech titled “Effect of Technology on Education in Middle East: Traditional Education vs. Digital Education”, she will be opening the session discussing classroom activities that involve students’ participation, recitation, presentation or reporting, that can help improve self-confidence. In the following Susanne Guenther, M.A. takes the floor with the topic ‘Effective Educational Practices for Beginning Students – An Analysis of Academic Discourses and Practical Necessities’. Currently Susanne Guenther works as an Academic Assistant for Communication and Media at Mittweida University of Applied Sciences. She has her Masters degree in International Relations and Communications from Chemnitz University, and is currently working on her Ph.D. thesis focusing on communication structures in multinational military settings. Her research interests focus on heterogeneity in academic settings, efficiency of teaching methods as well as communications habits of international actors. She also has several publications on didactics. Her topic aims at presenting how educational practices have to be pursued in order to promote successful academic development. It will challenge existing preconceptions and outlines practical teaching and supporting strategies of Mittweida University of Applied Sciences. The session then continues with Sheryl Tremblay from the DePauw University Greencastle, USA speaking about ‘Just One Course!’. Lastly Dr. Lara Martin Lengel and Yannick Kluch end the education and learning session with ‘Critiquing Globalization through Popular Cultural Texts: Communication Education for Social Responsibility’. The co-authors analyze the impact of popular cultural texts on teaching international and intercultural communication. They argue that televisual texts such as The Big Bang Theory and The Walking Dead are useful tools to analyze cultural meaning and identity construction in the communication classroom. Yannick Kluch is currently a Ph.D. student in the School of Media and Communication at Bowling Green State University and holds holds a bachelor‘s degree in Applied Media Economics from Hochschule Mittweida, Germany, and a master’s degree in Popular Culture Studies from Bowling Green State University in Ohio, USA. The third parallel session will be covering the topic ‘New Media Reception’ and will also take place from 2 pm until 3:30 pm on Saturday, July 18th. Gunther Heinrich from Stuttgart Media University, Germany will begin this session with his topic ‘Evaluation of a pattern based website classification ‘. Sven Hildebrand is currently focusing on his two Ph.D’s. Previously, he worked for numerous advertising agencies and served as the Chief Marketing Officer of the Techniker Krankenkasse. In his speech ‘Suspense and Quality of 2-D and 3-D Movies’, he will provide some interesting information about the influence of the display format on the experience of suspense. Furthermore, he will examine the influence of the display format on the overall rating of the movie. Nicholas S. Iwokwagh from Federal University of Technology Minna, Nigeria will present his topic ‘Enlarging Participatory Communicative Spaces on Adolescents Sexual and Reproductive Health in Nigeria: A Look at New Media Technologies’. His paper explores the possibilities for integrating appropriate NMT platforms for engaging adolescents in interactive communication discourses, thereby enlarging virtual communicative spaces for mutually beneficial sexual and reproductive health dialogue among Nigerian adolescents. 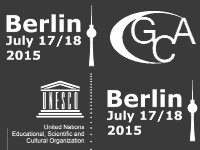 This entry was posted in News and tagged conference, gca2015, gca2015berlin, media, new, reception. The second parallel session will be covering the topic ‘Journalism and Distribution’. It will take place on the 18th July from 2 pm to 3:30 pm. In the following you get information about the speakers and their topics at the GCA Conference. Nedejda L. Greidina from University of Pyatigorsk in Russia will present her topic ‘Memes in Information Warefare Context in the South-East Ukraine’. This paper probes portrayals of the migration debate by cartoons in Kenya’s Daily Nation and The Standard and what they tell us about media management in the digital age. It assesses what their assumptions and biases tell us about the promises and limitations of the digital age in the majority poor world. Finally, implications for work on digital migration are discussed, with a particular emphasis on how media cross-ownership might inform efforts by nations to make the switch beyond the deadline provided by the International Telecommunication Union (ITU). This entry was posted in News and tagged Berlin, conference, digital transformation, GCA, Global Communication Association, glocalizing, international, journalism, journalismus, konferenz, media, medien. The next parallel sessions will begin on Saturday, July 18 from 2 pm to 3:30 pm. The first one will be covering the topic ‘Media Regulation’. In the following you can read all about the speakers of this session. Christine Horz from University Erfurt in Germany will start the session with her topic ‘The ZDF-decision of the Federal Constitutional Court and the reform of Public Service Media (PSM) regulation in Germany – a change towards diversity, plurality and media-governance?’ She received her PhD in Communication Studies at University of Erfurt, with a qualitative study about Iranian immigrant community media. Corinna Wenzel from Austrian Academy of Science in Austria will give a speech about ‘Public Media Subsidies – Democratic Media Performance? An international comparison’. Ayad Al-Ani from Humboldt Institute for Internet and Society in Berlin will deliver a speech about ‘Government as a Platform? Public Virtual Structures for Service Delivery and Participation as Elements of a Renewed Public Administration’. Dr. John Humphrey’s research interests are in the history of philosophy. He has published articles in ancient philosophy, nineteenth century philosophy, and critical theory in such journals as Convergence Review, Existentia Meletai Sophias: An International Journal of Philosophy, Nordicum-Mediterraneum, Philosophy and Literature, and Southwest Philosophical Review. He has also published a translation of Joan Stambaugh’s Untersuchungen zur Problem der Zeit bei Nietzsche under the title of The Problem of Time in Nietzsche. Dr. Humphrey is a member of the National Forensic League, the American Philosophical Association, the North Carolina Philosophical Society, the Society for Ancient Greek Philosophy, and the Western North Carolina Continental Philosophy Circle. Currently, Dr. Humphrey serves on the Board of Directors of Quaker House. He will present the topic ‘Democracy: Exclusion or Inclusion?’. The third parallel session will be covering the topic ‘Media Innovation and Convergence’ and will take place on Friday, July 17 from 4 pm until 5:30 pm. In the following you can read all about the speakers of this session! Prof. Dr. Sabine Baumann is a Professor of Media Management and Economics at the Institute for Media Management and Journalism at Jade University in Wilhelmshaven, Germany. It’s a great honour to have her at the GCA 2015, where she will be talking about two very interesting topics. Firstly, we’re going to hear a speech about the implementation of social media as a catalyst for knowledge. She will present that topic joint with Hendrikje Brüning. In addition she will give a second speech in an other session about a study that focuses on communication strategies on crowdfunding platforms. Hui-Jung Chang from Fu-Jen Catholic University, Taiwan will present a very interesting topic ‘Facebook interruptions in the workplace from a media uses perspective: A longitudinal analysis’. We are also proud to introduce Jennifer Wangeci Kanyeki as a speaker for the GCA conference 2015. Jennifer Wangeci Kanyeki holds a Bachelor’s degree in Electronic Media and Public Relations and is currently enrolled in the Masters program Communication with a focus on Media studies at Daystar University in Nairobi, Kenya. She is working as a correspondent reporter at Standard Media Group in Kenya, reporting on real estate, lifestyle, human interest & health stories in areas such as maternal health and child survival. She aims to use media and the arts to influence society and to develop professional media practitioners in Africa. Her Topic: ‘Overcoming convergence challenges in East Africa’s media houses: Standard Media Group’ explores how media houses can drive the process of media convergence to use the same reporters to produce multiple media platforms for newspaper, television, radio and internet mediums. She will identify the challenges of media convergence in East Africa and outline how to overcome those challenges. The second parallel session will be covering the topic ‘Education and Learning’. Since there are many speeches regarding this topic, there will be a second parallel session of ‘Education and Learning’ on Saturday, July 18. The first one will take place on Friday, July 17 from 4 pm until 5:30 pm. We’re very pleased about the contribution of Mahboub E. Hashem in the upcoming conference. He will present us his paper about the “Role of New Media in Education and Corporate Communication: Trends and Prospects in a Middle Eastern Context”. He is Professor of Communication at the American University of Sharjah. He holds a PhD in Communication as well as a Master’s degree in Mass Communication and in Arabic Language & Literature. He has more than 10 years administrative experience and over 30 years teaching experience. His topic will focus on the role of new media on education and corporate communication in a middle Eastern context with special regard to their effects on Arab youths. Pavica Sheldon, Ph.D., is an Assistant Professor in the Department of Communication Arts at University of Alabama in Huntsville. She also holds a B.A. in Journalism from the University of Zagreb, and earned her Ph.D in Communications from Louisiana State University. She is an expert and author of over a dozen peer-reviewed articles on the uses and effects of social media, primarily Facebook. She also sits on the editorial board of several peer-review journals, and recently published a book, “Social Media: Principles and Applications”. Her topic will look into testing the emergency alert communications on college students’ threat assessment and the resulting behavior. Regina Williams Davis is chair of liberal studies at North Carolina Agricultural and Technical State University. Having taught for 16 years, she has a vast wealth of knowledge and experience. She examined three virtual Global Studies courses using a ‘case study’ qualitative research method. Therefore, in her speech she will focus on the challenge of developing an effective pedagogy for distance education in order to enhance global understanding. We are also looking forward to the contribution of Diloro Iskandarova in the upcoming conference. She is going to present her paper about ‘Problems of Forming Tolerance in the Educational Environment of Tajikistan’. She is working as editor-in-chief of the journal „Prospects of Development of Fundamental and Applied Linguistic Research“ and also as editor of the Persis’ Facebook Page and website. She holds a PhD and a Grand PhD in Linguistics. Her topic outlines sources of intolerance among the youth of Tajikistan as well as recommendations for the adoption of a series of measures with the aim of developing tolerance in the educational environment of Tajikistan. The second block of parallel sessions will start at 4 pm on Friday, July 17. ‘Digital Media’ will be the topic of the first parallel session (B1). In the following you can read all about the speakers and their individual topics. Amit M. Schejter (Ph.D., Rutgers) is Head of the Department of Communication Studies at Ben-Gurion University of the Negev in Israel, and visiting professor at Pennsylvania State University where he serves as co-director of the Institute for Information Policy. He served on and chaired a variety of public committees, and also counseled media and telecommunication entities in Israel and the Palestine. His talk will focus on the dynamics of the digital divide as they are influenced by the transition in how the media operate. It is a conceptual-theoretical talk, which illustrates, through unique longitudinal data not yet presented elsewhere, the consequences of the digital divide and how it is actually growing. He will give a speech joint with Orit Ben Harush & Noam Tirosh. Najia Ashar from Stanford University, USA will present her topic ‘Highly visual and digital safety training for journalists’. Banu Akdenizli is an Associate Professor & Chair of Public Relations and Publicity at Yeditepe University, Istanbul, Turkey. Her areas of interest and research include: International communication, globalization, new information & communication technologies, media studies, content analysis, and politics of communication. In this talk, Akdenizli will discuss if and how citizen journalism in Turkey is contributing to the country’s painful odyssey to democracy. The talk will focus on current examples of bottom-up journalism in Turkey.